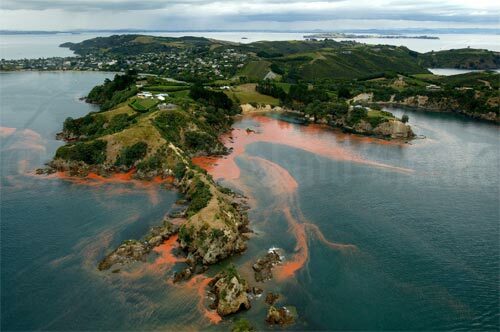 The common, non-toxic dinoflagellate Noctiluca scintellans often forms bright pink blooms around the coast in spring and summer, when there is an abundance of microscopic food. When disturbed, Noctiluca and many other dinoflagellates emit a burst of light. This accounts for the phosphorescent glow that often accompanies boats or swimmers as they move through coastal waters at night.